Last year,when i watch music station at Animax channel (astro), i accidentally hear Exile‘s song. Even though i forget which song that i hear, but it is enough for me to notice this band name and remember it. They song are quite good and each of his single (last year) at least stay at the top 3 in oricon chart. 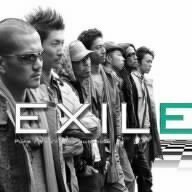 This entry was posted in Exile, Music and tagged direct download, download, Exile, Exile - Pure, Exile - Pure/You're my sunshine, Exile - You're my sunshine, Jpop, Pure, Pure ビデオ, Pure mp3, Pure PV, Pure single, Pure/You're my sunshine single, You're my sunshine, Your're my sunshine single by mofandom. Bookmark the permalink.